One cheat to rule them all, one cheat to find them. Is there any better way to start an article than with a verse from Lord of the Rings? Even if it’s an altered one? I guess not because even if you’re not LARPing in the forests with glued elf ears, you have to respect the epicness of Tolkiens masterpiece. The one ring promises unlimited power (including the one to destroy the soul of the one, who bears it), but as we know from Uncle Ben’s: With great rice comes great sauce. Ehm, I mean, with great power comes great responsibility. And today, I would like to show you a tool, that is very powerful. It’s the Words With Friends Cheat from wordgrabber.com. If you have ever played the famous word game from Zynga, you know the trouble: You have got a hand full of useless letter tiles like Q, X, Y, Z and not the faintest idea how to use them. Or you try your luck in another language and challenge a mother-tongued opponent, who brings you back down to earth in just a few moves. Or you just want to learn new words, instead of using the same and same patterns each and every time. If you’re like me, looking for an E-N, every time you have got a Y, just to make Y-E-N for the thousandths time, you definitely need a bigger vocabulary. I mean, it’s really tough to learn new words in order to meet the in-game challenges, improve your statistics or simply to get more points. I bet you don’t have a thesaurus on your nightstand and neither have I. So, if you want to improve both your language skills and your gaming experience, give it a shot and show me what you think! But always remember the words of Tolkien (or Stan Lee). If you overuse the power, you run the risk of losing the one and only thing, that matters while playing a game: Fun. What do you think about this outstanding words with friends cheat, that we’ve discovered? Tell us your opinion and drop a comment below! 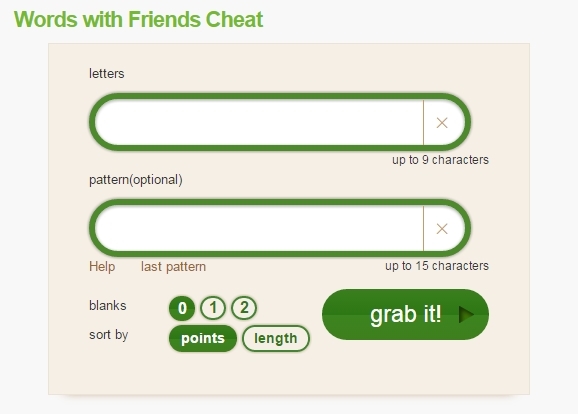 Hi, I’ve visited https://www.word-grabber.com/words-with-friends-cheat but it didn’t work. Could you please help me out? thank you very much for your comment. Could you please specify your problem? The site/link works perfectly fine for me, maybe it was just a server refresh or a temporary problem with your Internet connection. Hi Frederik. Now it’s working. Don’t know why. Anyway, thanks for your help!